Cleanroom LED Light Fixtures are ideal for general purpose cleanrooms, pharmaceutical cleanroom and biomedical labs, food processing centers and hospitals. Maintenance free, fully sealed 20ga durable steel construction housings maintain ceiling integrity and protect against infiltration of particles and airborne bacteria. Housings are painted with a white powdercoat finish. Precision engineered textured polystyrene diffuser. 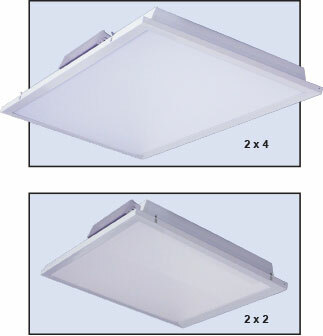 No visible diodes, hot spots, or shadows providing high uniformity and reduced glare. Standard fixtures feature a 120-277 multi-voltage long life LED system and a pre-mounted driver making installation easier than before. Mounting holes are also provided for hanging wire. LED projected lifetime is 60,000 hrs. The driver offers full range dimming from 0-10VDC. Installation is easy because an access box on the top bevel allows quick access for wiring to the building power source. 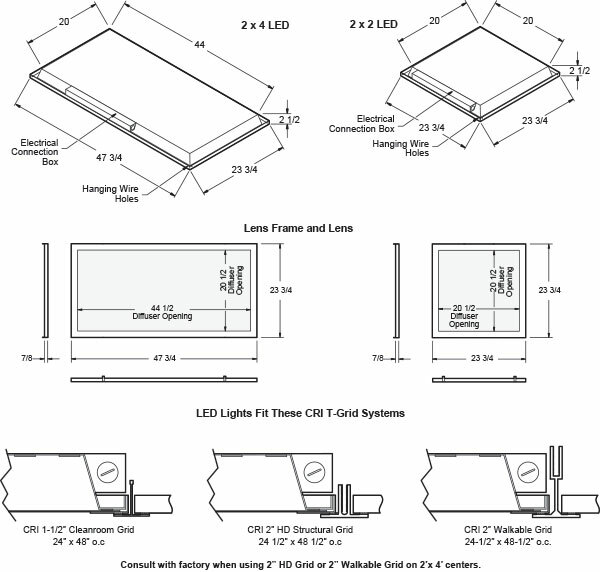 LED light fixtures are UL listed. Also, labeled as DLC QPL certified. All models are available with an optional Emergency Battery Pack. In the event of a power failure, a 2×4 fixture equipped with this option will deliver 1000-800 lumens for up to 90 minutes, a 2×2 fixture equipped with this option will deliver 1000-900 lumens for up to 90 minutes.